It’s every homeowner’s nightmare to realize that bees have taken up residence in your walls or attic. You might not even be aware of the problem until you notice bees or wasps flying around on the inside of your home or stains on your ceiling. If you have a colony of bees that have taken up residence, contact us at Sorenson Pest Control immediately. A single colony of bees can cause severe damage to the interior of your home, and when you add in the risk of being stung, concerns about allergies and the fact that some species of bees will return to a nest annually, it’s clear that you need professional help. When you notice flying, stinging insects, the first question that needs to be answered is what type of stinging insect you have. In our service area, there are several types of stinging insects that might find their way into your attic to build their homes. Each requires a different treatment method. California is home to everything from sweat bees, bald-faced hornets, European hornets and various types of bees. Some of these are fairly harmless to humans, but some, like the European hornet, can be aggressive and have the capability to sting multiple times. Depending on what you have in your attic, different treatments are needed. For honeybees, it’s preferred to salvage the colony by removing and relocating the queen. Honey Bees, while they can sting, are not typically aggressive. You still don’t want them in your home, due to the honey they produce. Over time, the sticky substance can cause property damage, wiring issues and more. Other infestations, such as wasps, are known to chew through the interior walls if their preferred exit and entry is treated. The last thing that any homeowner wants is to be confronted with stinging insects that number in the hundreds and have free access to living spaces, so it’s a bad idea to attempt to drive the colony out by treating the passageway they use to enter your home. It’s also worth noting that depending on the species and time of year, it’s possible that there is a queen nesting in the colony. If you’re successful in removing all active signs of infestation, once that queen matures, she’ll begin a new colony in the nest that remains. In order to ensure complete elimination, the nest must be removed. If, after treatment, you notice any of the following signs, contact us for re-treatment. It’s possible that another colony has moved into the abandoned nest, or that incubating eggs have hatched. Buzzing or chewing noises within your ceiling. Stains on your walls or ceilings. The presence of wasps or bees around the chimney, eaves or roofline points on the exterior of your home. The presence of bees or wasps flying within your home. Bees and wasps can be difficult to remove and may require multiple visits, but we can’t stress enough the dangers of attempting to treat this pest by yourself. Not only will the treatment likely be ineffective, but you also run the risk of physical harm to yourself. 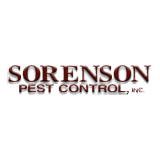 For stinging insects, rely on the professionals and contact Sorenson Pest Control. We’ll help you remove all signs of bees and restore peace in your home.